With its 01dB, Metravib and OneProd brands, ACOEM works with decision-makers in industry, defence and the environment throughout the world. Through its ONEPROD and METRAVIB brands, ACOEM offers solutions to improve the productivity and reliability of industrial processes. ONEPROD is a range of equipment and condition monitoring services (CMS) for the industrial and energy sectors, ensuring that production facilities are maintained operational at the lowest cost. 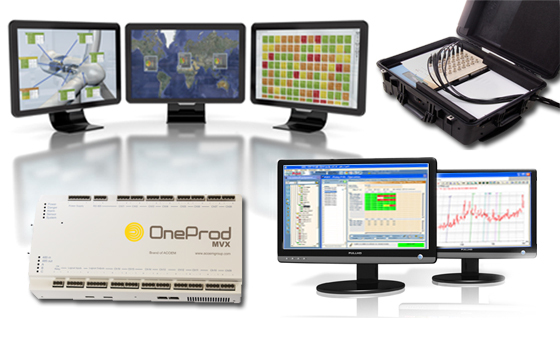 The ONEPROD range also includes data acquisition and processing solutions via simple and effective web interfaces, enabling operational staff to focus on their jobs and decision-making. Through METRAVIB, ACOEM offers its expertise in the field of noise and vibration engineering, combined with its know-how in system reliability. From design to the search for solutions, METRAVIB helps manufacturers, design offices and laboratories in the quest for ever more reliable and higher-performing products. This dual expertise in predictive maintenance and solutions engineering makes ACOEM a unique partner, dedicated to innovation and with more than 40 years of experience shared with the industrial world and its reality.